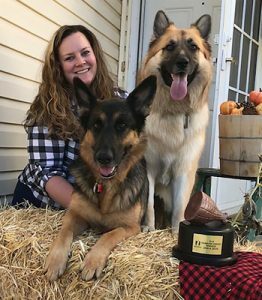 Ziva and Zeus, a pair of German Shepherds from Medical Lake, Washington, are the 2018 recipients of the 10th annual Hambone Award®, honoring the most unusual pet insurance claim of the year after they went missing for 21 days and were found inside an abandoned missile silo. 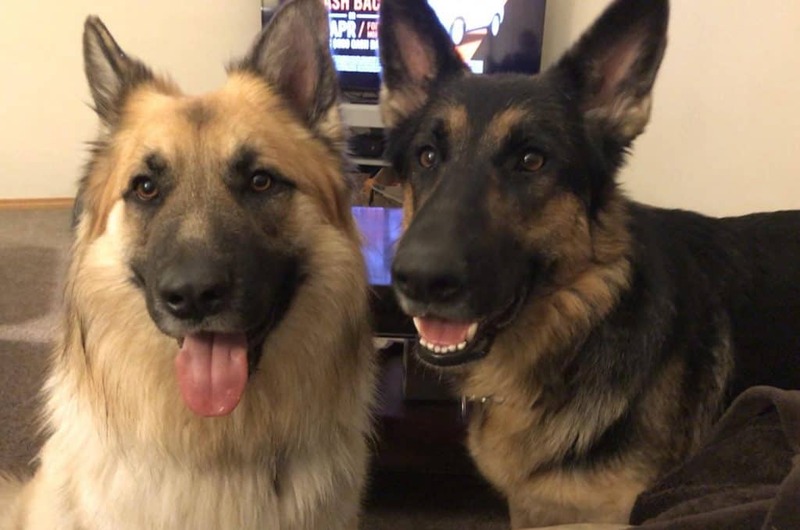 After graduating from nursing school in 2015, Jessica Donges and her husband welcomed their first dog into their home, a German shepherd puppy they named Ziva, after a character on their favorite show, NCIS. The day of the incident, Ziva and Zeus were playing together outside when they discovered a hole in the backyard fence. Being curious, they went to explore the unknown. Holding onto hope that the duo was nearby, the couple did everything they could to find their dogs. Jessica made posters and flyers to hang up around town, and used social media to spread the word. With help from her family and the community, Jessica was confident she would be reunited with her missing pups. Walking slowly along private property that was fenced off, Jessica came across a hole in the fence and proceeded to enter the field through the opening. Unsure of what to expect, but looking for some sort of closure, Jessica walked into the silo very slowly, keeping her eyes and ears open to anything. After a few minutes, Jessica came across a garage door opened knee high, and heard barking. Hesitant to lift the garage door, and unsure of what dogs were on the other side, she used her mobile phone flashlight to look under the opening. With no sign of anything, Jessica heaved the garage door open only to find complete darkness. Hearing familiar barking to her right, Jessica turned and found a hole, about 10 feet deep by 40 feet long, occupied by Ziva and Zeus. Minutes later, local police and firefighters were on the scene to help remove Ziva and Zeus from the hole. Immediately after lifting the duo to safety, the pair began running around excitedly, wanting to play. Although neither seemed to have any noticeable injuries, they were visibly emaciated. Jessica grabbed Ziva and Zeus and immediately rushed them to Pet Emergency Clinic to be evaluated and treated. Both dogs received a comprehensive medical evaluation and bloodwork. Ziva, who lost approximately 25 lbs., was given antibiotics, medication for anxiety, and treated for a gash on her leg that resulted in follow up care. Zeus lost 30 lbs., and was treated for hotspots in several areas, as well as giardia and elevated liver enzymes. After weeks of close observation and small changes to help them readjust back to normal living, Ziva and Zeus were on their way to a full recovery. Second Place – Blitzen, a dachshund from Carle Place, New York. Blitzen went on a “foodie” adventure, chewing a hole through the kitchen wall. Third Place – Dottie, an Irish setter from Irwin, Pennsylvania. Dottie had an electrifying fall into a heated pond that shocked both her and her owner. Fourth Place – Cheddar, a Labrador mix from Fairfield, Connecticut. When a birthday brunch got smoky, this canine found himself under a falling chandelier. The 12 nominees were chosen from more than 1.5 million claims received by Nationwide during the past year. All pets considered for the award made full recoveries and received insurance reimbursements for eligible veterinary expenses. Thousands of votes were cast at HamboneAward.com from Sept. 25 – Oct. 8 to determine the winner. To read the stories and see photos of all 12 Hambone Award nominees, visit HamboneAward.com. The Hambone Award is named in honor of a Nationwide-insured dog who got stuck in a refrigerator and ate an entire Thanksgiving ham while waiting for someone to rescue him. The dog was eventually found, with a licked-clean hambone and a mild case of hypothermia. This quirky title was first awarded in 2009 to Lulu, a hungry English bulldog who swallowed 15 baby pacifiers, a bottle cap and a piece of a basketball. The Hambone Award and these unusual pet insurance claims have since helped educate the public about the unexpected mishaps that can affect household pets. Stories and pictures of the Hambone Award nominees are available at HamboneAward.com. Nationwide pet health insurance plans cover dogs, cats, birds and exotic pets for multiple medical problems and conditions relating to accidents, illnesses and injuries. Medical plans are available in all 50 states and the District of Columbia. Underwritten by Veterinary Pet Insurance Company (CA), Columbus, OH, an A.M. Best A+ rated company (2017); National Casualty Company (all other states), Columbus, OH, an A.M. Best A+ rated company (2017). Agency of Record: DVM Insurance Agency. Pet owners can find Nationwide pet insurance on Facebook or follow on Twitter. For more information about Nationwide pet insurance, call 800-USA-PETS (800-872-7387) or visit petinsurance.com.